Written from a Christians perspective. 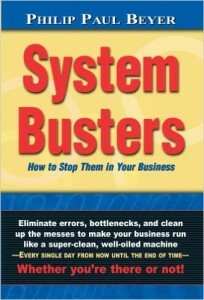 THIS BOOK IS FOR YOU if your answer is Yes to any of the following questions Troubled with CHAOS in your business? LOSING MONEY due to wasted time and resources? Stressed over MISTAKES recurring over and over? MISSED DEADLINES causing panic? Working LONG HOURS training and retraining personnel? OVERWORKED and no time for personal life? FRUSTRATED keeping your business clean and orderly? Constant INTERRUPTIONS with the same questions? THIS BOOK IS ALSO FOR . . . Those who want to learn how to organize and turnkey any type of business or organization service or manufacturing; Those who may not have a business education or training, but who have the drive and vision to launch their own business; Managers of small-to-large companies and organizations who want to improve their skills and see their company grow and prosper. AND FOR THOSE OF YOU who have many years of business education and experience, I feel confident you will pick up a few priceless nuggets of fine gold they were mined under extreme pressure!